KBC NOTE: Feb 2009 there are presently 1850 petitions from the Klamath Basin, Siskiyou County and the Karuk Tribe opposing the KBRA. Klamath County Commissioner Bill Brown reviews the 640 petitions of Klamath Basin residents opposing the Klamath Basin Restoration agreement. Today Steve Rapalyea, Vice-chairman of the Klamath Basin Alliance (KBA), submitted nearly 640 petitions objecting to the Klamath Basin Restoration Agreement (KBRA) to the Klamath County Board of Commissioners. Mr. Rapalyea asked the Board to consider these petitions as an example that the KBRA did not have the overwhelming public support that those in support of the KBRA would have them believe. 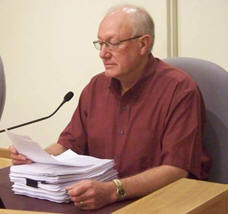 By request of Commissioner Bill Brown, the content of the petitions was read into the public record. Following is the letter accompanying their petitions. The Klamath Basin Alliance, Inc. has received over 600 signatures to a petition in opposition to the proposed Klamath River Basin Restoration Agreement. We are submitting these petitions in the hope you will take under consideration the objections to the proposed KBRA. These petitions are in addition to more than 1,100 petitions presented by the alliance to officials in the past five years against a federally funded tribal land gift alone, land that the tribes previously sold, and over 1,000 petitions collected by the late Dr. Calvin Hunt. With the packet of copies of the petition, we have also included a spreadsheet with the names of those who have signed the petition. Many of the petitioners are not just Klamath County residents, but residents of the region affected by the proposed water agreement. The Klamath Basin Alliance, Inc.